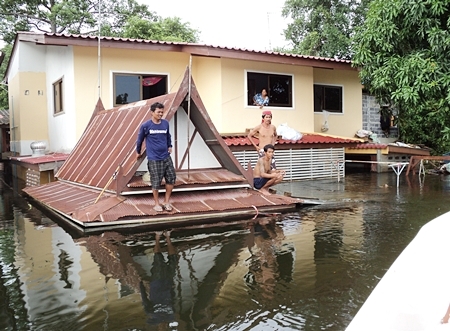 Sawang Boriboon rescue workers from Pattaya, using a new boat supplied by Securitas Thailand, rescue a family trapped on the roof of their home in Ayuthaya. As the disaster continues to worsen, more aid is needed for families like this, and groups of kind hearted people in Pattaya are answering the call. 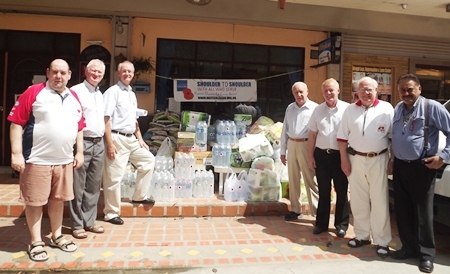 The mayor met with the committee on October 21 so that the group, led by Steve Graham, MD of Securitas Thailand and Gudmund Eiksund, president of the Rotary Club of Jomtien-Pattaya, along with Peter Malhotra, MD of the Pattaya Mail Media Group could update him on their effort to raise funds for immediate and long term relief efforts for the flood victims in Thailand. 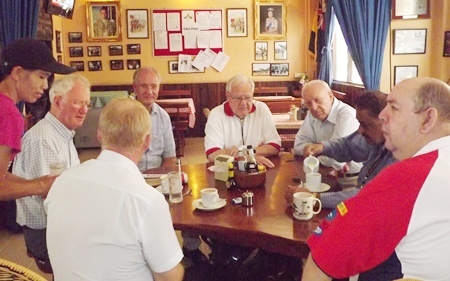 (L to R) Gudmund Eiksund, president of the Rotary Club of Jomtien-Pattaya, and Peter Malhotra, MD of the Pattaya Mail Media Group work with Mayor Itthiphol Kunplome on ways to help flood victims in Central Thailand. The packages were loaded onto a Securitas van that hauled them off for safekeeping. 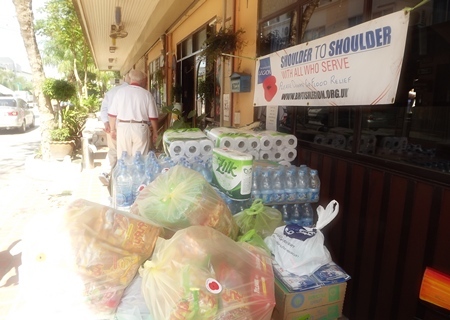 A caravan left Pattaya last Tuesday to bring the massive loads of aid packages to the people in the north. Bert continued, “We have members all over the world and received pledges not just from our members here in Thailand but the United Kingdom, Brazil, Iraq, Afghanistan, Malaysia and Vietnam. 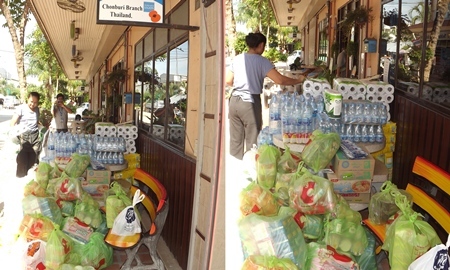 Within a few days we had more than 40,000 baht’s worth of food aid lying on Tropical Bert’s Bar! Getting the goods was a feat in itself and took members three shopping trips to the major department stores in town. 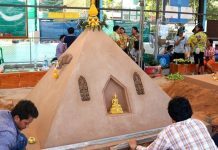 Donations were made not only by Legion members as we also received a generous donation of 15,000 baht from Lodge Pattaya West Winds, for which we are very grateful. 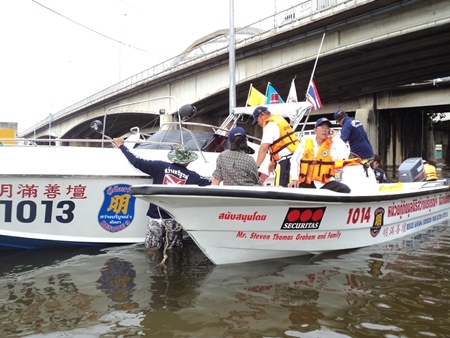 Sawang Boriboon Foundation rescue workers from Pattaya prepare to set out on a rescue mission in Ayuthaya in a Securitas Thailand rescue boat. 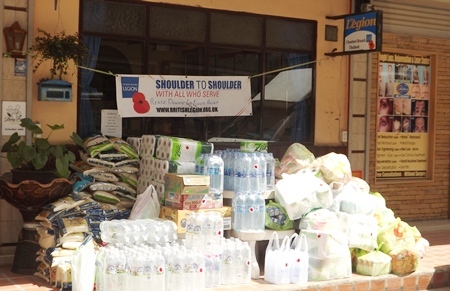 “Our next concern was how to ensure that the relief packages would be distributed correctly, so we turned to the Pattaya Relief Group for assistance. 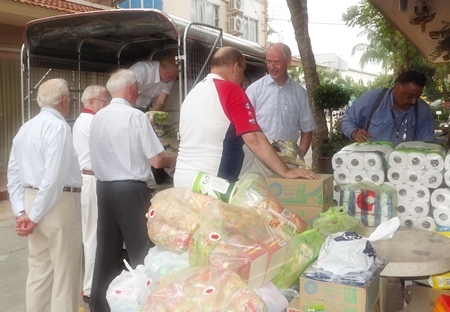 With the help of Rotary Club of Jomtien-Pattaya and Securitas Thailand we are assured that the goods will be delivered directly into the hands of the needy. (L to R) Bert Elson, Philip Wall Morris, Dieter Reigber, Dennis Stark, Gudmund Eiksund, Brendan Kelly and Peter Malhotra prepare to load up rescue supplies to send to flood victims. Next articleOut for a Duck!